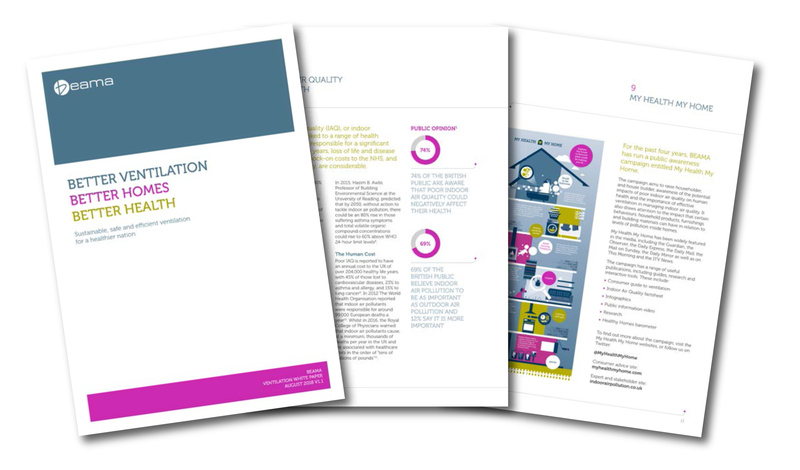 BEAMA has published its first Ventilation White Paper entitled Better Ventilation, Better Homes, Better Health with a raft of measures aimed at solving the issues facing the industry and helping to deliver better indoor air quality in UK homes. The Paper calls for compulsory assessments of ventilation provision following the installation of energy efficiency measures, a revision of Building Regulations to refocus on ensuring ‘in-use performance and end users’ needs’ and asks government to make it compulsory that all ventilation installations are undertaken by an installer who is a member of a competent persons scheme. BEAMA also call on the Government to make indoor air quality a government priority by financially incentivising the installation of ventilation improvements and undertaking public education campaigns on the health risks of indoor air pollution and the simple steps that homeowners can take to improve their own home air. Poor indoor air quality is responsible for thousands of deaths a year and millions of pounds worth of healthcare costs. It is linked to a range of serious health diseases including cancer, cardiovascular disease, chronic obstructive pulmonary disease and mental health conditions. In the shorter term it reduces cognitive ability and exacerbates allergic and asthmatic symptoms. As successive governments strive towards zero carbon homes, the installation of energy efficiency measures and the building of modern airtight homes has not been met with an equal consideration of the need for corresponding ventilation improvements — meaning that pollutants are becoming trapped inside homes putting householders’ health at risk.